In 1997 ASRS introduced two new reporting forms, for maintenance and cabin crew personnel. This month we share some of the reports ASRS has received involving cabin crew. A disturbing number of these described serious incidents of passenger misconduct and abuse of crew members. Our first few report excerpts involve that seat of many passenger transgressions--the lavatory. About 45-50 minutes after takeoff, we had a passenger who was sleeping, wake up screaming and pointing at no one. He locked himself in the aft lavatory and started to bang on the walls and continued to scream. I opened the door and told him his behavior was not appropriate nor would it be tolerated. He told me to go away or he would kill me! The crew figured he was drunk and searched his bags where we found a big bottle of [whiskey]. He was not served liquor on board. We finally got him out of the lavatory--we were fearful he would hurt himself in there. We had a minister who asked to help because the passenger was crying and upset about something. The passenger over the next hour became more belligerent and then violent--the passenger hit both myself and the #3 Flight Attendant, threatening to kill us several times. The First Officer helped us to restrain the passenger. He received similar threats and...the minister who helped us was punched in the face, again with the threats. Because of the time of night, both myself and the #3 Flight Attendant were able to spend time trying to contain this passenger. We both had to suspend our normal duties including our normal jumpseats for landing. I feel other passengers were upset and fearful. We were met by police and the passenger was removed. ASRS learned from a callback to several cabin crew members who reported this incident that a company report was filed about the disturbance. The FBI also investigated the incident, and a crew member pressed charges against the disruptive passenger. [The stowaway] was just out of a rehabilitation center for drugs... His eyes were dilated and he was nervous... A deadheading Captain and another pilot watched the stowaway during our service and kept him occupied. I kept him out of First Class and the cockpit. We "parked" a crew member near him at all times. We kept him in the rear of the aircraft for landing and during deplaning until the proper people could remove him... Since boarding cards are no longer checked, and an "on time" departure is so important--it puts pressure on everyone--rushing can lead to human error... In the future, someone should be assigned to check lavatories prior to closing of the door. A flight crew reported that the discovery of hazardous materials ("hazmat") carried on board by a passenger caused them to do some soul-searching afterwards about their handling of the incident. [From the First Officer's report] No matter how minimal a hazard our situation appeared to be, we may have neglected to take the most serious precautions necessary to protect the safety of our flight. I feel that there is not enough education of the public on hazmat and air travel. Ice can take its toll on aircraft on the ground and in the air, leading to less-than-satisfactory conclusions to planned flights. A Part 135 cargo pilot reports that a fast approach and a short, icy runway is not a good combination. I briefed myself for an approach to the long runway, then accidentally switched, spur of the moment, to a short runway. Bad choice. On our descent through 12,000 down to 6,000 feet, we picked up moderate-to-severe icing. Icing equipment was on, nacelles heat on, wings and stabilizer heat on. We did a missed approach, and picked up more icing to about 12,000 feet. Leveling, both engines flamed out within about five seconds of each other. It took two minutes to restart them. We proceeded to our alternate airport. Most likely cause was ice ingestion. [Maintenance] replaced the right engine--bent blades on the first stage [compressor]--and "dressed up" the left engine--several nicks. Each aircraft type has its own icing characteristics, but most require the anti-ice equipment to be turned on before encountering icing. Ice that adheres to some unprotected sections of the aircraft may shed suddenly, as was apparently the case in this incident. 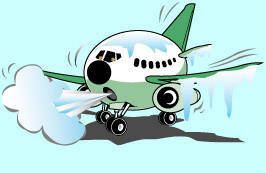 Ice may also persist long after the aircraft has departed icing conditions. Well before an aircraft leaves the ground, icing needs to be given serious consideration. An air carrier Captain tells how long delays for weather, resultant schedule pressure, a nighttime departure, and a possibly inadequately-trained ground crew combined to set the stage for a potential icing disaster--averted by two sharp-eyed passengers. We had waited for threshold deicing for 3.5 hours. I told the deicer that I wanted the entire aircraft deiced and the engine inlets checked for contamination. After about 20 minutes, the deicer returned to the interphone to advise me that the aircraft was clean. After starting the left engine, I was called by one of the Flight Attendants, and was told that a passenger as well as a deadheading Flight Attendant had noticed that the wings were still covered with snow and ice. We shut down the engine, and recalled the deicer...to respray the wings. I also had the First Officer perform a cabin inspection, and he also confirmed that the inboard third and aft half of the left wing contained large areas of snow and ice. It is apparent that standard phraseology of "Your aircraft is clean" does not insure the level of safety required. Had it not been for an observant flight attendant and passenger, our takeoff might have been jeopardized. The First Officer's report concludes that standard procedure should include a visual inspection of the aircraft by a cockpit crew member after the deicing process. Although it is not a requirement, many pilots already follow this sage advice. A pilot reports that her small twin-engine aircraft was deiced prior to takeoff on a snowy IMC day, but that the deicing process created a whole new problem. Preflight and before-takeoff checks all normal. Only thing out of the ordinary (or not so out of the ordinary for this aircraft) was that the heater would not ignite while holding short of the runway, and it had while [repositioning earlier]. Radio reception caused me to ask how Tower heard me. Their readback was loud and clear, so I assumed all was normal, perhaps just my position or this particular radio. After becoming airborne, I did not receive any further radio transmissions. I tested both radios--nothing. I began a turn back towards the airport, but had lost sight of it, so began the lost communications procedure for the XYZ Departure. Then I noticed no navigation equipment. I went to squawk 7700 and noticed no transponder. Then I looked and saw no electrical. Big problem because of lack of familiarity [with the area]. [After circling], I relocated the field and landed. I followed the airport manager [to taxi] back to base. Postflight inspection found excessive amounts of deicing fluid everywhere--alternators, aft compartment where battery is located, engine nacelles, etc. It was later determined that more than 76 gallons of deicing fluid had been used to deice the aircraft. The initial heater and radio problems were ignored because the aircraft had some history of electrical "glitches," but the reporter states that such glitches will not be ignored in the future.